ORANGE WALK TOWN–In a welcome turn of events for the Chinese community, a Chinese storeowner, instead of being the victim of a shooting by thieves, as has occurred in countless robbery scenarios in the country, managed to turn the tables on a thief by shooting him during an attempted robbery on Friday. The gunman died on the street outside the store, where he fell after being shot, and was taken to the nearby Northern Regional Hospital, where he was declared dead on arrival. As of press time tonight, Thursday, his accomplice, who fled the scene with the loot, has not yet been found. 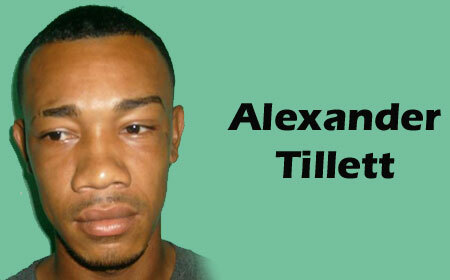 He has been identified as Alexander Tillett of Orange Walk Town and a wanted poster has been issued for his arrest – he is considered to be armed and dangerous. According to a police report made on Tuesday, September 23, “At 3:10 p.m. on Friday September 19, acting upon information of shots being fired on Otro Benque Road, Orange Walk Town, police visited Hung Yun Store, located at #2 Otro Benque Road, where the owner of the store reported that two dark-complexioned men entered his establishment and pointed a handgun [at him] and ordered himself and his shop attendant to lie on the floor. “The men then took $500 in cash and two cell phones, all to a total of $1,075. “The men then ran out of the shop, at which time he [the shop owner] took out his licensed 9mm pistol and followed them. When one of the men made a motion to pull something from his pants waist, he fired several shots in his direction, hitting him on the right side of the body, causing him to collapse on the street. “His name [the gunman] was learnt to be 30-year-old Leslie Kenrick Logan of Santa Familia Street, Orange Walk Town. Police conducted a search on him, which led to the discovery of a handgun. “Police have since retrieved (1) 9mm pistol with a magazine containing (11) 9mm live rounds from the owner of the establishment. The other robber made good his escape, as police investigations continue,” said the police report. At the time there were two persons who were shopping in the store. A witness in the store told police that the armed thief put the money in a bag, which he handed over to his accomplice, who ran out of the store and rode away on his bicycle, leaving the gunman behind. The armed thief then put the gun in his pants and tried to likewise escape out of the store, the witness said, but when he turned around, the storeowner took out his gun and shot him. The witness said that the thief tried to take out his gun again to shoot the storeowner, but he was unable to do so because he had already been hit, and he fell outside the store. According to the witness, the thief was shirtless, and so the witness was able to observe four bullet wounds on him – one in his shoulder, and three in his abdomen. The gun which was reportedly found inserted under the waist of Logan, Jr.’s pants by police at the scene, was classified as a 40mm pistol. The scene then was processed, and five 9mm expended shells also were recovered. The Chinese storeowner was detained briefly, but released as police continue to investigate. A file has been prepared and sent to the office of the DPP for further instructions.